Gov. Nathan Deal today announced that as part of his FY2014 budget proposal, he will seek an additional $50 million in funding for the Savannah Harbor Expansion Project at the Georgia Ports Authority Board meeting. If approved, the proposal will increase state funding for the deepening project to $231.1 million. Overall, the cost of the project is anticipated to be $652 million. The Record of Decision, signifying final federal approval for the project, was issued in October, allowing for construction to begin in 2013. Gov. Nathan Deal today announced that the state’s largest insurance company, State Farm Insurance, is bringing 500 new jobs to Georgia. The new jobs will be located at the recently leased Atlanta Perimeter Operations Center located near Perimeter Mall. The office is expected to open for business later this year. While some existing State Farm employees will work at the new facility – it will be staffed by predominantly new hires. The new facility will help the company provide sales, service and claims capabilities to better serve their customers. State Farm and its affiliates are the largest provider of car insurance in the U.S. and is a leading insurer in Canada. In addition to providing auto insurance quotes, their 17,800 agents and more than 65,000 employees serve 81 million policies and accounts – more than 79 million auto, home, life and health policies in the United States and Canada, and nearly 2 million bank accounts. Commercial auto insurance, along with coverage for renters, business owners, boats and motorcycles, is also available. State Farm Mutual Automobile Insurance Company is the parent of the State Farm family of companies. State Farm is ranked No. 37 on the Fortune 500 list of largest companies. For more information, please visithttp://www.statefarm.com or in Canada http://www.statefarm.ca. Gov. Nathan Deal today announced that CHEP USA, the industry leader in pallet and container pooling solutions and a part of Brambles Limited, will relocate its headquarters to Atlanta. The company plans to bring 173 jobs to the new facility over the next five years. Sign Up for the Morning News Summary. 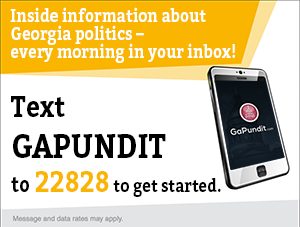 Text GAPUNDIT to 22828 to join our email list!